For the last few years I have watched as other schools opened up Maker Spaces or Design Rooms at their schools. The positive energy the teachers used to describe how wonderful the experience has been for themselves and their students made it certain to me that we would need something like this at our school. I did not want to buy first and figure out later as I wanted to find a curricular fit and a curriculum for teaching our students. Thanks to my friends, Matt Scully at Providence Day School and Leigh Northrup at Cannon School a group of us we able to visit their school’s spaces to learn how they approached incorporating a making culture into their schools. The approaches they took are slightly different but both schools reconfigured space to accommodate having a making space with tools and a flexible environment. Someday we will need to reconfigure a space on campus so we have a dedicated room like they do but not at this time. Ventilation is important as is access to electrical power so we need to figure out if a present day computer lab could become the making space or if we need to look elsewhere. The making cards from Leigh will be used to help our Making Makers Club develop the making mindset as the cards feature a Thing (to make) Materials (to use) and a Descriptor (to add). On the iPad or using a small whiteboard, each student designs their Thing using the materials and descriptor. This lasts for 3 minutes to design and share with each team member. Teams will then attempt to find ways to improve the prototype. If the teams get a prototype built that they want to 3D print that will be an option. Of course Design Thinking is also a very important part of the process so we will introduce these concepts to them using resources from Stanford’s d.school, Henry Ford Learning Institute, and Meadowbrook School’s Eureka Lab These are the important skills to help students understand and integrate into their learning. John Spencer shared this great resource last week that we may also use as he uses slightly different language to describe the process. When it comes time to construct 3D models we will use Project Ignite from Autodesk which uses the popular Tinkercad online software to teach 3D design and construction. The goal is not to find something to print but to design something that absolutely needs to be printed. We will try the iOS apps: 123D Design for Education and Tinker Play from Autodesk. While not as robust as the desktop apps they do allow for playing around and learning more about how to create objects. We currently have 2 – Polar 3D printers although in truth one is the Lower Schools but I have been using it for troubleshooting purposes. I like the printers as they have a nice web interface and allows for students to share projects with me. The printers can be finicky as every 3D printer can be as I have found out so they are a great entry level printer as schools get a discount and they will give you plenty of practice with learning the ropes of 3D printing. 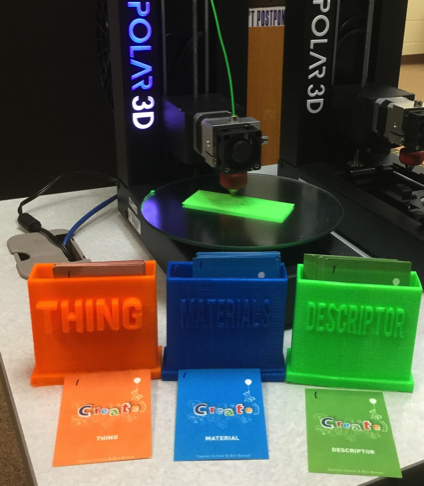 Contrary to what many people believe, 3D printing in schools is full of failed prints, trial and error, and messing around to get the printer to print. Frankly it is all a part of making although it reminds me of when I was trying to get all of the Macintosh LCII computers to print to an inkjet printer using AppleTalk since when it worked it was awesome, but when it did not work, I spent a lot of time trying to figure out why not!